A Chepang girl with her kids in this recent photo. 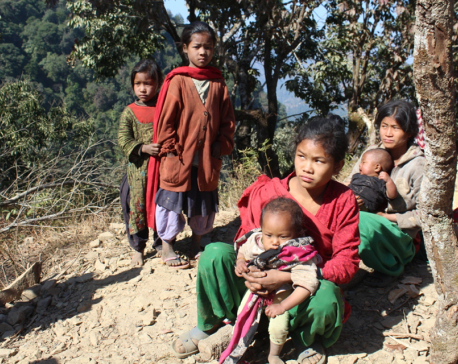 DHADING, April 13: Twenty-one-year-old Sanukaanchhi Chepang of Benighat, Rorang-1, Chimang is a mother of three. She has a son and two daughters at such a young age. As she eloped and married at the age of 13, her present days are spent rearing children and carrying household chores. “Getting married and growing kids at an early age was quite troublesome. Now, I want to study but I give up thinking of my responsibilities toward my home and children,” lamented Sanukanchhi. She gave birth to four children between 15 to 20 years. Of them, she lost her third child. Reflecting back to her school days, she recalled the three-hour long journey to school due to which she decided to elope away. Unaware about the harms of getting married at an early age, she expressed her remorse over having to deal with numerous hurdles and problems. Dropping out of school leaves young Chepang girls with the only alternative of getting married. Since schools are located far away, young girls either stay home or get married. “The trend of getting married at an early age is a prevalent practice in the Chepang community. Since there was no one to inform the hazards of early marriage, I was easily willing to get married,” she added. 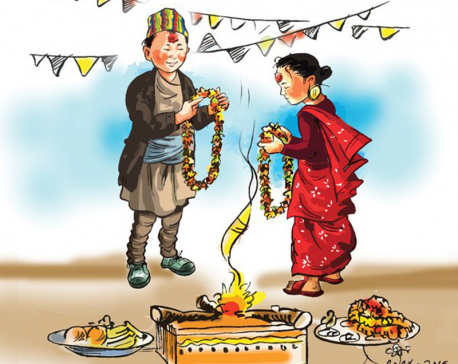 Although the minimum legal age for marriage is 20 in Nepal, the practice of child marriage is still prevalent in many parts of the country. Having raised three kids at 21, Sanukanchhi is a mere representation of thousands of young mothers in the country. Despite, many organizations and governmental bodies running campaigns under the slogan 'Bibaha wari bis barsa pari', the activities hardly seem to draw any favorable outcome. Low economic status and lack of access to easy education are the factors behind such practice. Cchild marriage is still practiced in many areas of Rorang and Gajuri rural municipalities in Benighat of southern Dhading. Every home in each village of Chepang community has young mothers bearing infants. Kalpana Chepang of Benighat, Rorang-10 faces a similar plight. At 19, she is looking after her two children. Like many of her next door friends, she eloped while studying at grade 6 and got married at the age of 16. “The village schools had education only up to the primary level. So, we were left with two options - either to walk for miles to reach school or get married. Back then, we hastily took a big decision of life and discontinued our studies but now we realize the value of education,” lamented Kalpana. Chepang girls also face an acute lack of access to right medication which mounts the risks of miscarriage among them. Many of the young mothers deal with numerous health hazards due to lack of proper prenatal care and nutritious diets during pregnancy. Head of Nepal Chepang Sangh, Tilak Chepang, expresses his grief over the inability to eliminate early marriage in the area. “The importance of birth gap and the usage of contraceptive are to be primarily acknowledged by the people in order to minimize these social problems,” stated Tilak. According to the census of 2011, altogether 68,699 Chepangs are recorded in the country. 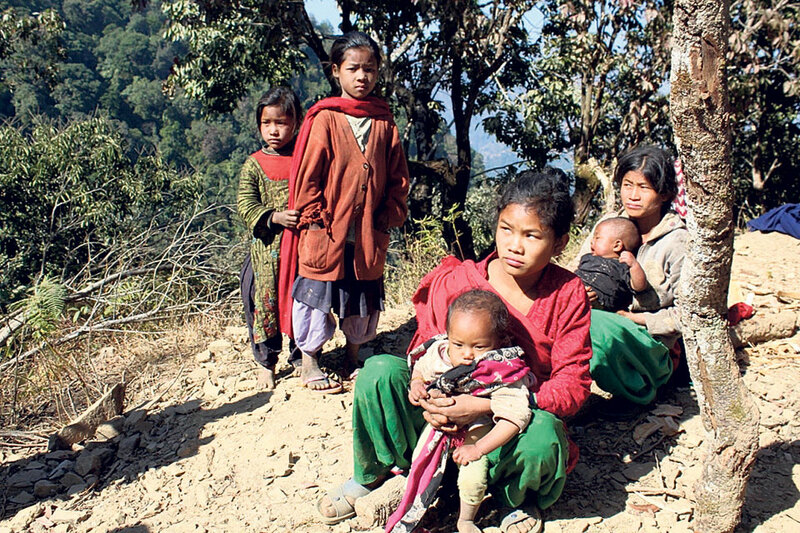 Out of them, an estimated 18,000 Chepangs reside in Dhading. 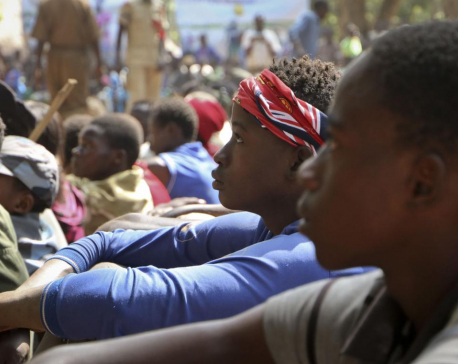 Despite numerous campaigns against child marriage, the approaches are less effective. On top of it, lack of education, awareness and prenatal hygiene seem to take a huge toll on the situation of young Chepang mothers.